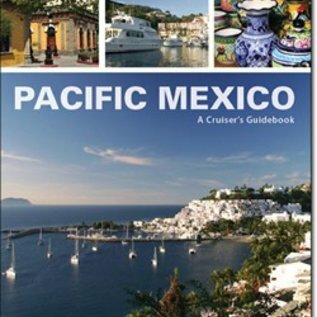 Pacific Mexico: A Cruiser's Guidebook, 1st edition 2010, is the most up to date and comprehensive guide detailing the anchorages and harbors of the Pacific mainland coast. The guide contains in depth coverage of the harbors and anchorages used by cruising boats travelling along the Mexican mainland coast from Mazatlán to Zihuatanejo. For boats continuing south towards Central America, harbor charts are included for this more remote section of coast. In an area where the official government charts can be up to two miles off, boaters can travel with confidence knowing that the locations described in this guide are illustrated with 72 original GPS-accurate chartlets featuring detail not available elsewhere. Chartlets are derived from current surveys, satellite photography, US and Mexican topographic and bathymetric data, as well as the author’s first-hand exploration. GPS waypoints including prime anchorage locations, approaches, and navigational hazards accompany each chartlet. Detailed charts don’t necessary tell the whole story, so the authors have also included stunning color photography, high resolution aerial photos, and annotated approach photos. And since the cruising life doesn’t stop once the anchor is dropped or the dock lines are made fast, detailed city maps, marina guides, fuel stops, provisioning locations, surf breaks, hiking trails, dive and snorkel sites and much more are also included with each location, helping voyagers make the most of their time on this beautiful and friendly coast. Important cruising information such as weather, ham and SSB radio nets, customs and immigration information, marina locations and layouts, fuel availability, boat haulout facilities, and marine chandleries are among many of the features detailed throughout. Sample itineraries are also included to fit a variety of boater’s schedules to help insure that readers don’t miss a thing while exploring the Pacific mainland coast. 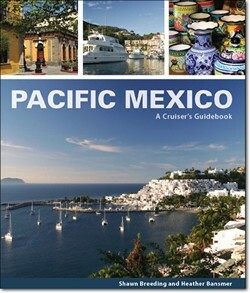 Pacific Mexico: A Cruiser’s Guidebook, is a must for anyone heading to Mexico. This beautiful guide will be equally at home on your chart table while living your cruising dreams, or on your coffee table at home while planning your adventure to the warm waters, swaying palms and sandy beaches of Pacific Mexico.